Join us for our book club starting March 24, in the Recovery Cafe, at 11:30a, for a community discussion of this work led by our very own Kevin Haley! You don’t need to be caught up to join in the discussion, and copies of the book are available for $15 in the front office. See you there! 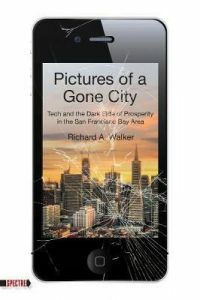 Pictures of a Gone City: Tech and the Dark Side of Prosperity in the San Francisco Bay Area begins by tracing the concentration of IT in Greater Silicon Valley and the resulting growth in start-ups, jobs, and wealth. This is followed by a look at the new working class of color and the millions earning poverty wages. The middle chapters survey the urban scene, including the housing bubble and the newly exploded metropolis, and the final chapters take on the political questions raised by the environmental impact of the boom, the fantastical ideology of TechWorld, and the tech-led transformation of the region.